The Anatomist [LibraryThing / WorldCat] was an interesting plunge into one subject (anatomy) and three lives (the author of Gray’s Anatomy, the illustrator of that same book, and the author of this book). It was not the book I expected when I opened it, but it was nevertheless a very enjoyable read. What began as a biographical look into the life of Henry Gray, the author of the Gray’s Anatomy, quickly took two detours. One was caused by the dirth of first-hand sources relating to Dr Gray, a man who died young and whose personal papers were destroyed long ago. 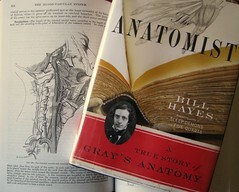 Hayes responded by delving into the papers of his collaborator, fellow anatomist Henry Vandyke Carter, whose illustrations graced the pages of the classic textbook. Using Carter’s diary as his primary source, Hayes tells the dedicated and somewhat tragic story of both lives. The second detour was Hayes’ first-hand experience with anatomy. He audited several college anatomy courses during his book research and shared his experiences from the dissection labs. That may not sound appealing, but Hayes makes it extremely interesting. (Anyone who is fascinated by the lab work shown in any of the contemporary forensics-based television shows will feel at home, in fact.) His lab work parallels the Gray’s Anatomy text and his inspection of various body parts illuminate the wonder that anatomists find in the human body. At times, his use of metaphor is remarkably poignant. Before the book concludes, Carter’s diary leads to India while Hayes and his partner travel to St George’s Hospital in London (where Henry Gray spent almost half his life). Back home in America, Hayes’ threefold biography comes full circle — again in a most-unexpected way. This was not a pure biography of Henry Gray. It was better.